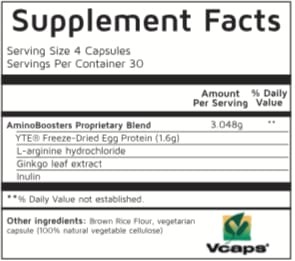 AminoBoosters contain full strength pure Norwegian-process YTE® which is a highly absorbable bioavailable source of the 23 most required Amino Acids by the human body. The human body is comprised of approximately 20% protein and Amino Acids are the basic building blocks of all proteins in the body. Don't waste any more time and money on overpriced alternatives which don't contain genuine YTE® at the right dose. Don't risk using a formula with dangerous or unethical ingredients. Only AminoBoosters and AminoPure+ have genuine YTE® at the right dose in our proprietary, powerful, natural supporting formulas - and always honest pricing. Remember, the Ginkgo Biloba in AminoBoosters is not suitable for people using blood thinning (anticoagulant) or epilepsy medication, when pregnant, breastfeeding or for children. If that's you, look at AminoPure+ instead - find out more at getyourboomback.com/products/aminopure. For everyone else, AminoBoosters are your recommended choice. Choose a single Trial Bottle or go for the Subscribe & Save option and save 8.00% - plus save your time and frustration! Don't run out again AND save money on each month's subscription. Price includes shipping and GST. Can be cancelled at any time - and of course covered by our famous Worldwide 30 Days Triple Guarantee. YTE® is a patented food supplement developed and patented by the Norwegian government and made exclusively in Norway. YTE® stands for young tissue extract, This is because it is a nutrient that is extracted from fertilised hen eggs that have been incubated for 9 days. Using a patented process that extracts all of the core nutrients from the egg white called PreEmbryonic Stage Extract (PESE). YTE® was first discovered back in 1929 by a Canadian Doctor, Dr John R. Davidson. Dr Davidson was observing fertilised hen eggs and realised that on day 9 of incubation the egg went through an incredible growth spurt that caused a tripling of the embryo inside the egg. He hypothesised that the nutrients inside the egg on this ninth day must be very powerful if they could cause a tripling in the growth cycle that was enough for a fluffy chick to hatch just 12 days later. Dr. Davidson then began successfully treating his patients by injecting the YTE® nutrients. However unfortunately he died just as he was seeing success with his technique and his research was lost for almost 50 years. That was until 50 years later when a Norwegian scientist working with the Norwegian government made the same discovery as Dr. Davidson that the fertilised hen egg contained very potent nutrients on the 9th day of incubation. 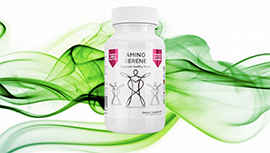 As nutritional and scientific understanding had advanced a lot since 1929 the Norwegian scientists understood immediately that the nutrients extracted contained a special combination of amino acids and protein fractions including a complete array of 23 Amino Acids, vitamins, minerals, proteins as well as some very important growth factors. YTE® is a very well documented and studied food supplement appearing in several published and peer reviewed studies and a google search will show you that there are a few companies around the world selling a YTE® based product. However all the studies that were conducted used a daily dosage of 1600-1680mg which is 4 tablets a day of either AminoBoosters or AminoPure+ with pure YTE® powder. Until now, other companies have sold just 30 capsules for more than we sell a full month's 120 capsule supply. Get Your Boom! Back are hands down the best priced and most genuine supplier of pure Norwegian-process YTE® in supportive botanical formulas. To start “Getting Your Boom! Back” click on the buy now button at the top of the page. Choose the Subscribe & Save option and save 8.00% - plus save your time and frustration! Don't run out again AND save money on each month's subscription.